"Right. Get those thyme paths sheared off. 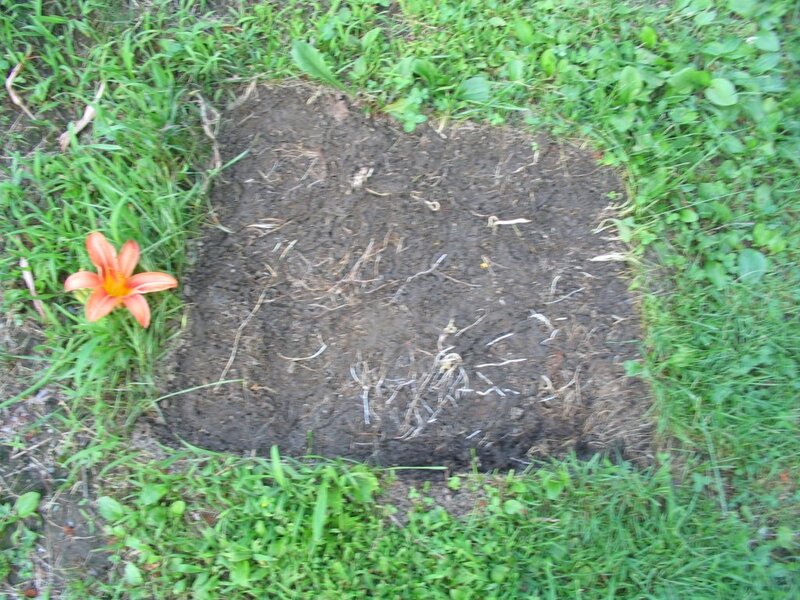 Then do the deadheading. Don't forget, you have to pot up those new plants. Look sharp, now!" This inspiring hour-long film on community and theraputic gardens in the New York area will be shown in NYC on Channel 13 on July 27 at 10 pm. The film is by Alexandra Isles, and includes some very poignant moments of testimony by some lost souls who have been pulled back from the brink by caring for a garden. I don't know if it will be shown in other cities, but why not call up your local PBS affiliate and ask that it be broadcast in your area...can't hurt. This wonderful film's worth the effort! 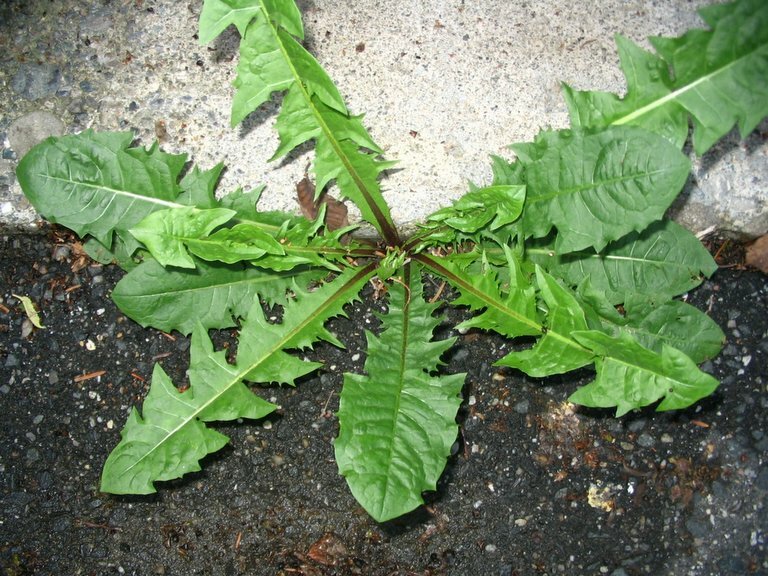 I have just become aware of a plant that everybody seems to be mentioning, and I have just researched online. It is Brazilian verbena, and I just saw it today in the magnificent Conservatory Garden at Fifth Avenue and 105th Street, Manhattan. What a fabulous and peaceful refuge the Conservatory Garden is...there's a greensward with broad yew hedges, with an emperor fountain [single jet going up] at the back, a parterre knot garden with fountain, and a "Secret Garden," a selection of wonderful perennials and unusual annuals. Here's where I saw the Vb, and swore to come home and look it up. You see, I have been reading this plant name everywhere, from the haute scribblings of Roy Strong [see "The Laskett" book review, previous] to the more workmanlike pages of my Brit gar mag,"Garden Answers." I just saw it yesterday morning at the local Cobble Hill park, amid a very nice, tiny planting at the entrance. And now in the Conservatory Garden today...I think I am meant to plant this one--it is a hardy annual, perennial starting zone 7 [not in the Berkshires! 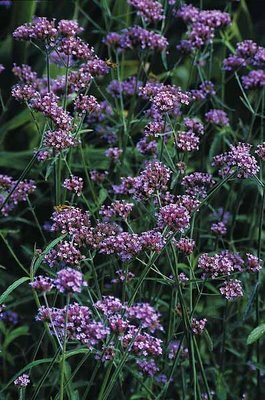 ], has a base whorl of leaves, then sends up almost leafless stalks ending in tiny bouquets of verbena flowers. 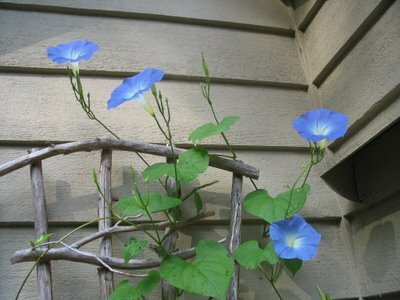 The effect is tall and very very airy, so it can even be planted in the front of other stuff. It sounds like you can't make a placement error with Vb, and that is great news for The Clueless Gardener, who can never get things right. I know you have heard of this plant for years, but I am a very slow learner. Can't wait til next spring! 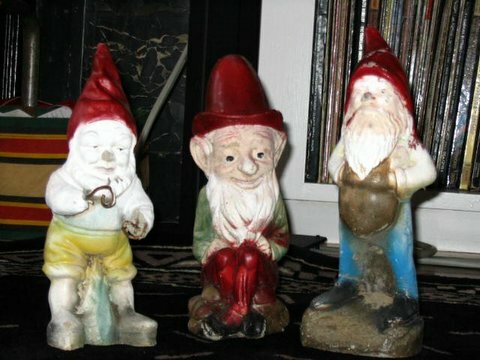 ...and tell sad stories of the death of -- trees. This is paraphrasing Shakespeare's Richard II feeling particularly sorry for himself ["and tell sad stories of the death of kings" is how it really goes], because I am feeling sorry right now. I just had a very old, important tree removed from my yard because it had died. It was a spruce, I don't even know which kind [remember, I am Clueless], but it was very very tall, and a tree that I loved. It began to die before we got this house, I believe, and the dying branches just crept up and up the tree until I couldn't ignore it anymore. 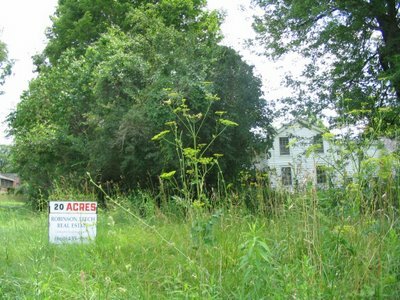 It was taken down yesterday, and I won't see the bare front yard until I arrive at the house tomorrow. It will be a jolt of sadness--not as bad as losing my dog, mind -- and will take an adjustment in my mind's eye. But I will be so sorry not to see it there. Now comes the next problem. This tree shielded the front of the house from a very very busy road. I'm talking about the sight and sound of whizzing cars slamming on the brakes, and of semi tractor-trailers downshifting to low gear because there is a sign ordering drivers to slow down from 45 to 25 mph--right in front of our place. Something must be planted in place of the spruce, but at this point, I've no idea what! When I do figure it out, it will be an opportunity to add something major to this old landscaping that we inheirited, and that is the opportunity borne of this crisis. Anyone have any suggestions? Wish me luck! Along with weeding, feeding, planting and worrying, I have just read a great gardening book. If you're a fan of British gardening books, this is an intriguing one. 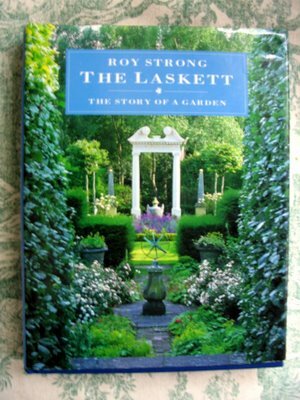 Sir Roy Strong, a somewhat eccentric Englishman who has been head of Britain's National Portrait Gallery and the Victoria and Albert Museum,has written the story of his garden in Herefordshire, "The Laskett." 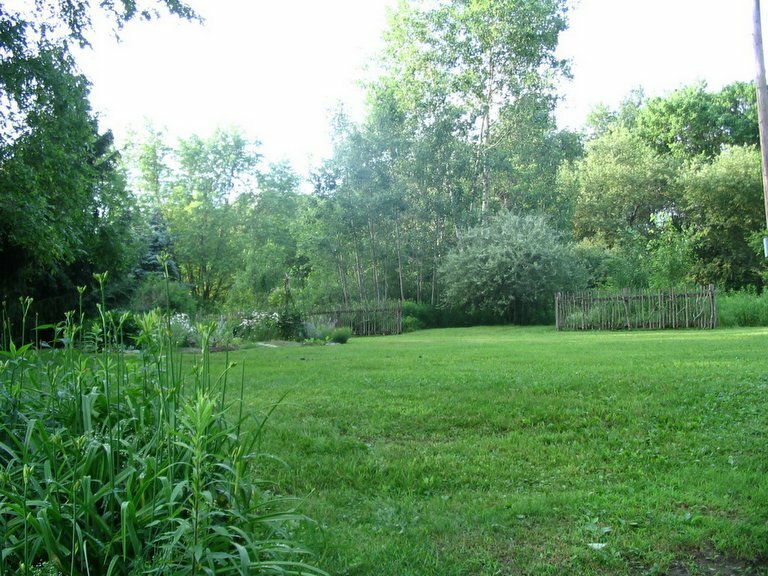 Together over 30 years, he and his wife Julia Oman, an accomplished theatrical designer, created an amazing garden that is definitely on my "to visit" list. This isn't a book of practical advice, by any means! I finished the book, and still don't know how they managed to lay out the plan, build in hardscaping, plant hedges, and install statuary to create "The Laskett" garden. 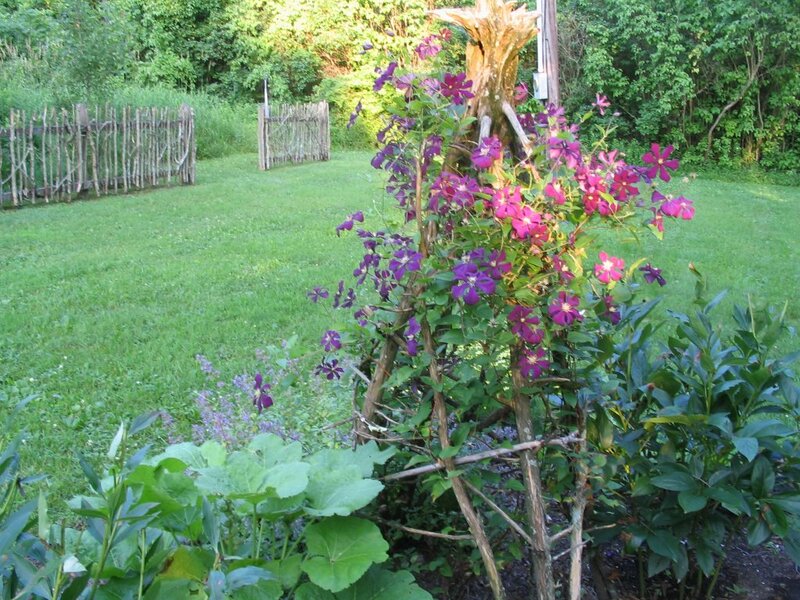 But that really is no matter--this is a travelogue for garden lovers. If you have a thing for boxwood parterres, as I do, this is the book for you! The Laskett is full of formal garden motifs, and they are beautiful--but never too much or pretentious. The layout of the entire garden emphasizes vistas...glimpses over long spaces to a statue or view beyond. There's even a great gardening drama involved, something any gardener can sympathize with--box blight destroyed much of their 20-year-old parterre work, forcing Strong to resort to yew and heather to rebuild the garden rooms. For this is a garden of rooms, like Sissinghurst or Hidcote. A visitor [which will someday be me with any luck] walks along a series of paths, hedges of yew and hornbeam, alles, and orchards, and will behold a small greek temple, a doric gateway, fountains, enough statuary to satisfy any former museum director, going from garden room to garden room...each more beautiful than the last, showing creative ideas to solve spatial layout puzzles. Each garden room, created slowly over a period of many years, is named for and commemorates an achievement milestone in either Strong's or his wife's amazingly distinguished careers. No bragging on their part, just fact. The greek temple celebrates Strong's tenure at the V & A, the rose garden is named for a lecture series in America, several walk alles denote operas or ballets designed by Oman, and one garden room is a remembrance for their 50th birthdays. Roy Strong is a bit of a name dropper, as he was a figure in London cultural life for several decades, and he even helped Prince Charles with the hedges at Highgrove, his country house. But the fact is, Strong simply puts into the book the stories of all his inspirations, and these include many famous gardeners, gardens, and British upper-eschelon celebrities. The man can't help it. If you are an anglophile in addition to a garden lover, this is a book infused with the love of Being English. 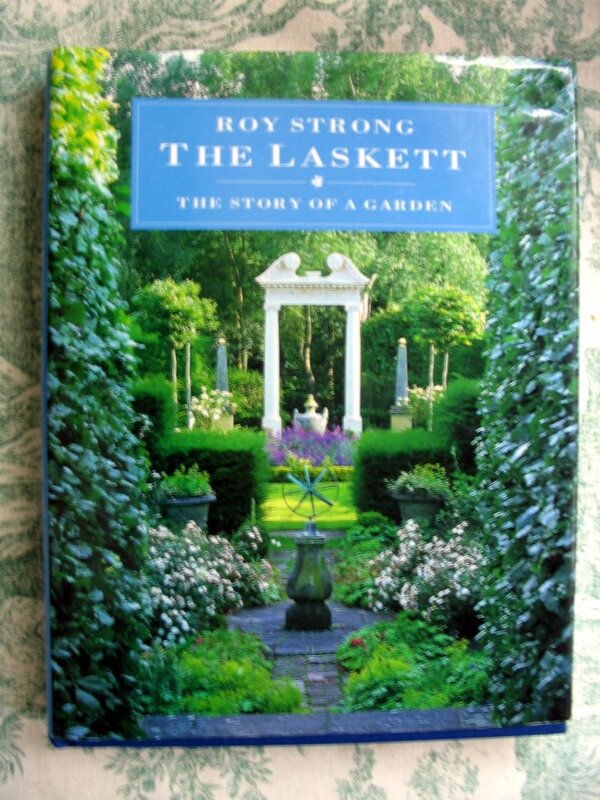 "The Laskett" forms a triumvirate, in my mind anyway, with two other stories of British gardens, "Vita's Other World," by Jane Brown, the story of Vita Sackville-West and Harold Nicholson's Long Barn and Sissinghurst, and "Gertrude Jekyll's Lost Garden," by Rosamund Wallenger. These two are also so enjoyable to read, it really raises armchair gardening to an art form. Of course, after one reads these books, one looks at one's own very prosaic gardening efforts with a much diminished esteem! 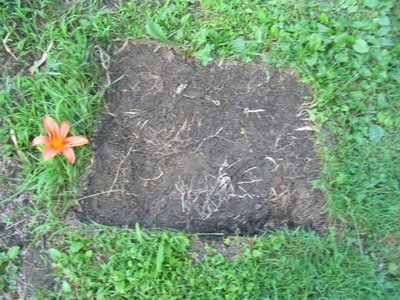 Especially after reading of the amazingly obscure plantings in each of these three gardens, I want to get out a shotgun and put my 'Stella D'Oro' daylilies out of their misery. Those two adorable mice who are living in my flowerbed are about as cute as disease vectors can be...! I do know that such field mice (aren't they also called white-footed mice?) help bring lyme disease to fortunate people like moi, who just can't keep out of the yard. The mice carry the deer tick around when the actual deer aren't, but the upshot is they help make contracting lyme disease easy as pie. And I have been a happy contractor thereof. I have had lyme disease two and a half times...the first [half] time was undiagnosed, the second time diagnosed after feeling awful for three or four months, the third time after seeing the bull's eye on my flabby stomach. 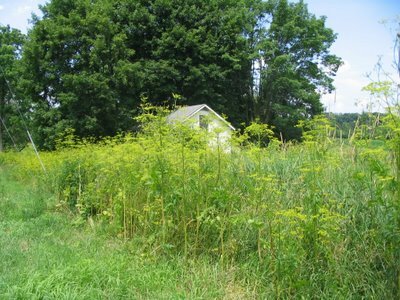 A simple regimen of doxycycline did the curative trick, and I recovered quickly once on the meds in cases two and three. But then what did I do? Did I give up gardening? That's strictly impossible -- unthinkable. 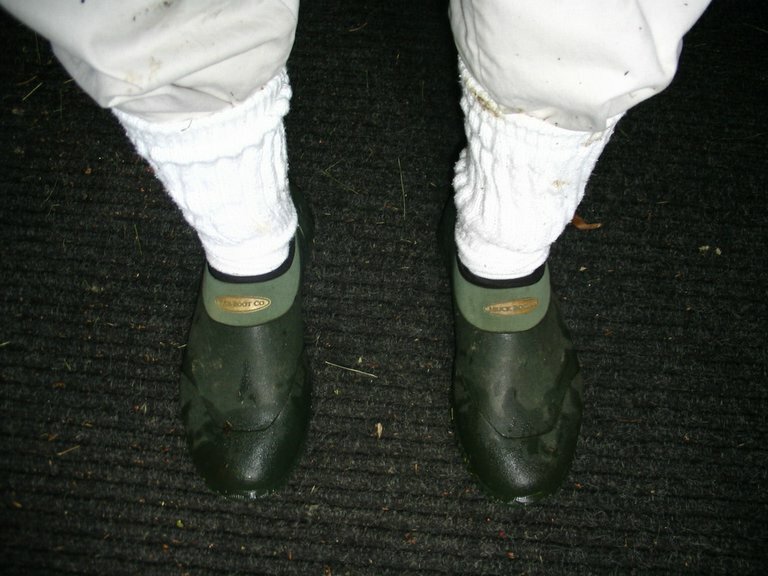 So, I wear my hideously nerdy anti-tick uniform every single time I am in the yard: long-sleeved white t-shirt, light tan jeans, white socks over the cuffs of the pant leg. See geek fashion illustration photo, below! Oh, yes, and accessorized with a cloud of Deep Woods Off all over my exposed skin, and sprayed on all clothing. But here is the kicker: I've been dressing ultra-carefully like this forever, since long before I ever got LD, and I contracted it three times anyway. So, if I'm gonna get it anyway, shouldn't I just run around in the yard barefoot in short-shorts and a wifebeater, and simply take an antibiotic once a year---? Naw--I look terrible in short-shorts. I'm now posting my garden cartoons on my sister-site ibrakefordelphiniums.blogspot.com, but be warned...I am clueless in cyberspace as well as in the garden, so the setup and reproduction quality might be on the iffy side until I figure out what I am doing! 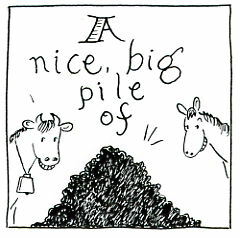 In the meantime, look at the preview drawing above, and realize that every entry, is, in the end, garden fertilizer...right?! Here's the Mice's House--But are they still home? In addition to being clueless, did I mention I can be negligent? I left an overturned flat tray on the gravel path in the flower bed, oh, say, 4 weeks ago. Never moved it. Kept working in other spots, and when I was near it, just stepped over it. 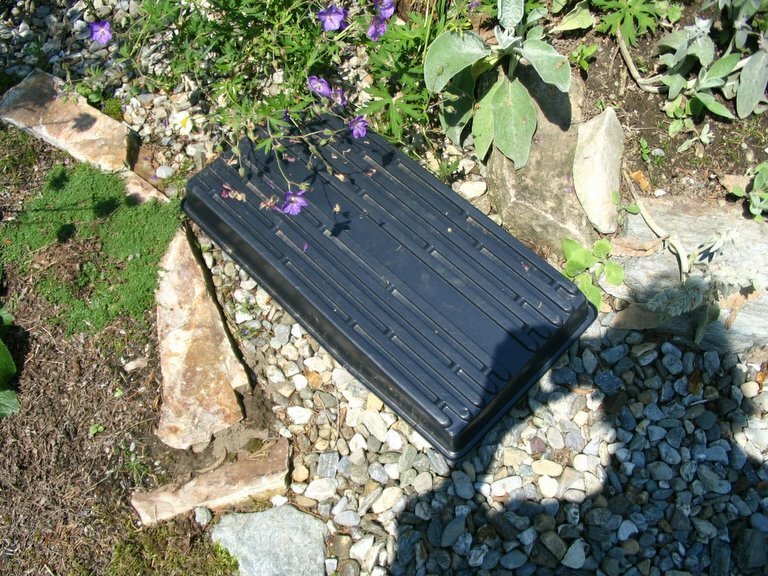 "The Lazy Gardener" [the second choice for this diary's title] left the tray there, week after week. 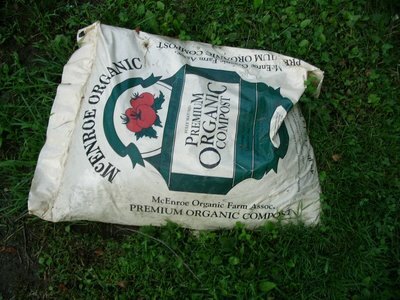 Well, yesterday I finally lifted it up to fling it out of the flowerbed once and for all. And underneath it, lying in a perfectly-round, very comfy nest, were two field mice living the Life of Riley. We all did a full 2-second double take, because each of us was absolutely astonished. I think the online shorthand for what we were thinking is "WTF?!" And then they ran away into the flowerbed to hide. When I recovered from my surprise, I felt very bad that I'd bothered them, and put the tray back in its place. I don't know what I want to have happen--I can't lift up the plant tray to see if they've abandoned the nest or not, the result of which being I can't really work on that little part of the garden, but I don't want to bother them, either! I'm such a softie... the mice were clever enough to realize that this was the homesite of their dreams, so who am I to evict them?